Napoli didn’t allow Liverpool — a finalist last season — a single shot on target. “More and more, this is becoming Ancelotti’s Napoli. He’s changed a lot and we’re following him,” said Lorenzo Insigne, who scored in the 90th minute. This week, all four Italian clubs posted impressive wins in the Champions League. Roma, last season’s surprise semifinalist, routed Viktoria Plzen 5-0 behind a hat trick from Edin Dzeko; Paulo Dybala also scored three as Juventus beat Young Boys 3-0; and Inter Milan came back from a goal down to win 2-1 at PSV Eindhoven. It’s the first time since 2005 that four Italian clubs won on a single Champions League match day — a two-day span — since Juventus, Udinese, AC Milan and Inter achieved the feat in 2005. That was also the year when an Ancelotti-coached Milan was beaten in the final by Liverpool. Napoli was playing in the third division 13 years ago. The southern squad had been declared bankrupt a year earlier and was reformed under the ownership of film producer Aurelio De Laurentiis, who remains Napoli’s president. 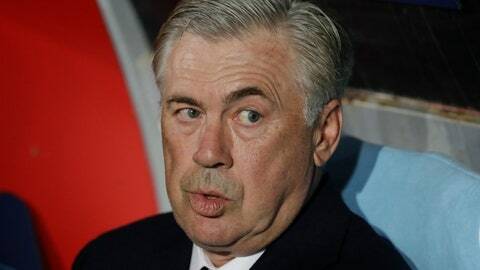 Ancelotti also coached Milan to two Champions League titles, plus one more with Real Madrid. He also coached Juventus, Chelsea, Paris Saint-Germain and Bayern Munich before replacing the popular Maurizio Sarri — who left for Chelsea — at Napoli. De Laurentiis remains unpopular among Napoli supporters for letting Sarri leave and was quick to laud Ancelotti after the victory over Liverpool. Ancelotti made a surprise move by starting Nikola Maksimovic, who is normally a central defender, at right back in a 4-4-2 formation. The move paid off with Maksimovic able to help out defending Liverpool’s dangerous trio of strikers — Mohamed Salah, Roberto Firmino and Sadio Mane. With the game still scoreless, Ancelotti brought on forwards Simone Verdi and Dries Mertens in the 68th minute — sparking a fresh assault on the Liverpool goal. Mertens quickly volleyed off of the crossbar and Liverpool’s defense seemed exhausted by the time Insigne ran on to Jose Callejon’s cross for the winner. Liverpool manager Juergen Klopp had brought on Daniel Sturridge, the striker who scored a late equalizer against Chelsea on Saturday, only in the 88th despite calls for him to play more. Insigne also scored a free kick against Klopp’s Borussia Dortmund in his Champions League debut five years ago and he could have scored more on Wednesday if not for a solid performance from goalkeeper Alisson. The victory vaulted Napoli to the top of Group C with four points, one ahead of Liverpool and Paris Saint-Germain. Red Star Belgrade is last with one point.